My father told me that both of his grandfathers were murdered and he never knew either of them. His father’s father was the first ancestor I wrote about for Amy Johnson Crow’s “52 Ancestors Challenge”. He was killed in a shoot-out in 1899 at the young age of 37 years. His mother’s father, John Cobb, was stabbed to death in 1915 at the age of 56 and this is his story. John Franklin Cobb was born in Franklin County, Mississippi on 25 September 1859, to Jesse and Sarah (McCaa) Cobb. 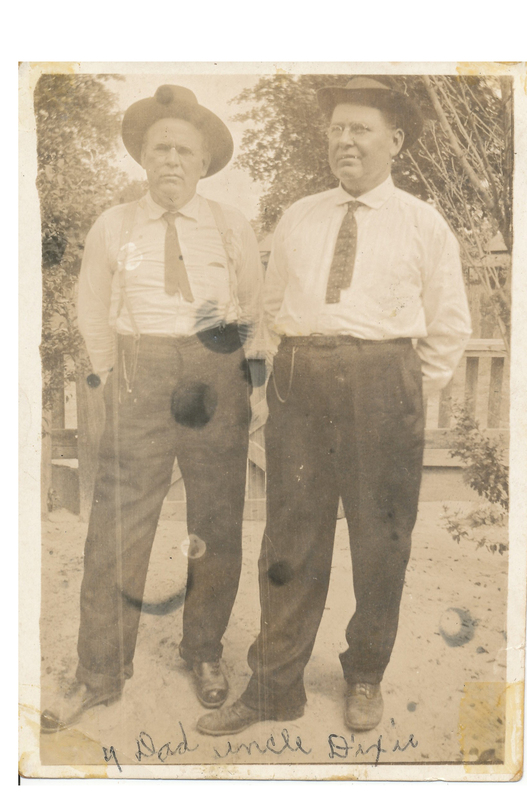 The Cobb family migrated to Nacogdoches County, Texas in the years between 1870 and 1880. Like so many during the 19th century, John was a farmer, until the lumber industry brought many sawmills and employment to the heavily wooded areas of East Texas. 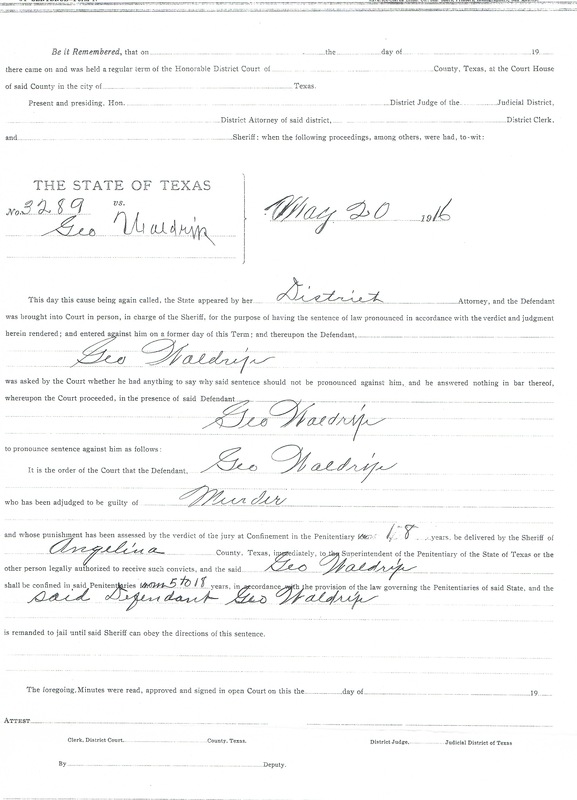 In the 1910 Federal Census John’s occupation was as a laborer in a lumber mill in a small community called Wildhurst in Cherokee County, Texas. He met his future wife, Susan Jane McCullough, in Rusk, Texas and they were married on 5 December 1893 in Cherokee County. According to the 1910 census this was John’s second marriage but I have not yet been able to find any information on his first marriage. John’s death was tragic and left his wife of 22 years with seven children at home. The oldest child at the time of his death was my grandmother, Velma, who was twenty years old and the youngest was their son, Alvie, who was only a year old. My grandmother told my father the story of her father’s untimely death and apparently didn’t try to cover up the events which lead to his demise. Daddy related to me that John was killed by a neighbor as he was riding his horse home after “messing around” with the man’s wife! My grandmother went looking for him and found him on the side of the road, stabbed and dying. I don’t know what kind of father that he had been but she must have been pretty angry at him for what he did and the hardship it put on her mother. Mama Cobb (my great grandmother), had her hands full and depended on the oldest children to help work the farm and care for the younger ones. In the 1920 census, five years after their father’s death, all of the children were still living at home. The three oldest children were girls, Velma, age 25, Annie, age 23, and Jessie, age 21, and the next four were boys, John, age 19, Acie, age 17, Earnest, age 9, and Alvie, age 5. It was unusual for girls in their twenties to still be single and living at home in the early 1900s. Velma, and her sister, Annie, stayed at home to help keep house and work on the farm while the other daughter, Jessie, worked as a nurse. Both of the older boys worked for the lumber mill so it seems that the family was taken care of financially. 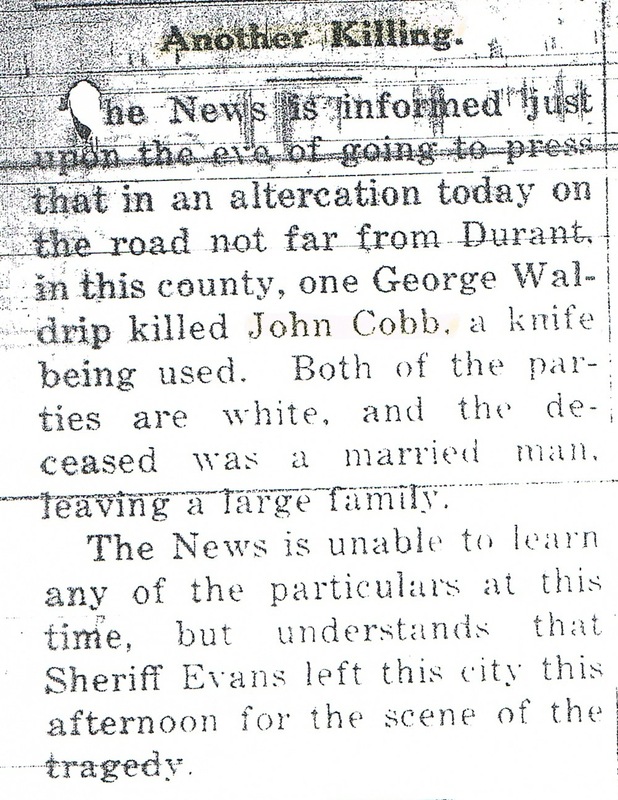 John Cobb’s funeral expenses were $53.25 according to the funeral records of Gipson Funeral Home; $45.00 for casket, $7.50 for burial robe, and $0.75 for death notice in newspaper. It listed his cause of death as gunshot wound but the newspaper article about the incident said he was killed with a knife and the family corroborates same. Angelina County, Texas criminal court records show that John Cobb’s murderer was found guilty and sentenced to 18 years in the penitentiary. This is all I know about John Cobb, and unfortunately, I know more about his death than his life. Note: I still don’t know who Uncle Dixie (in the picture with John Cobb) is except that he must be his brother and Dixie is probably a nickname because John didn’t have any brothers with that name. 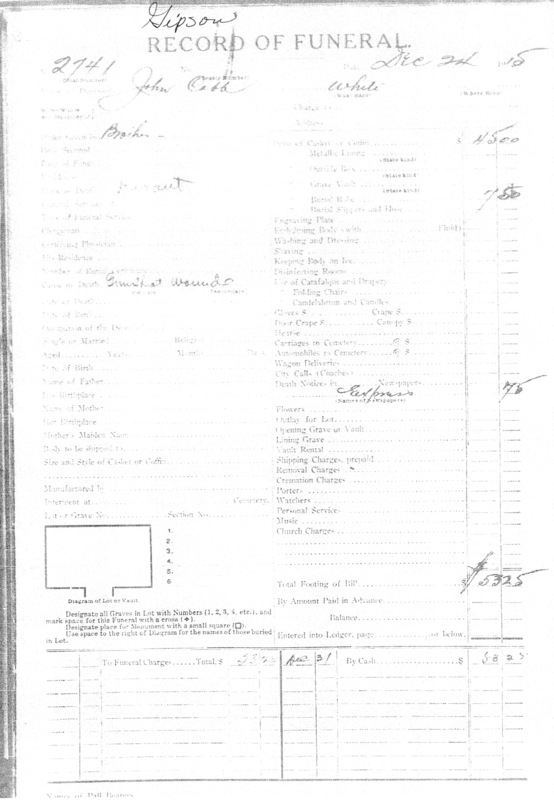 This entry was posted in 52 Ancestors Challenge, Cobb, Surnames. Bookmark the permalink.